filtration unit. This Recycling System that can be directly connected to your parts cleaner. Actual distillation, not just simple filtration Small, light-weight and portable – 29 lbs Can be incorporated into any parts washing or bulk system Easy to use, sets up in minutes StillClean can be customized to your process to maximize savings and productivity Recycles a wide range of 105 to 150 degree flash point solvents Output of 1 gallon per hour of pure clean solvent 115 VAC I 5.4 Amps power requirements 0.5 CFM ® 80 PSI compressed air requirements ETL listed to UL Standards 201 and 2208. 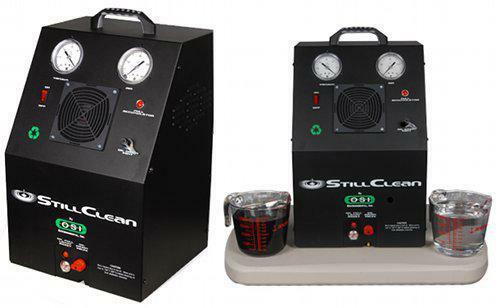 The StillClean takes the dirty solvent from your parts cleaner and uses a patented, low-temperature vacuum distillation process to separate your solvent into two parts: clean, water-like solvent, and oil.